Collectively our team has over 100 year’s industry experience. We strive to build relationships based on trust and open communication where client satisfaction is our priority. Our commitment to the delivery of projects on time, under budget and to industry leading levels of quality, enables Momentum Built P/L to provide responsive and effective construction solutions, tailored to each of our client’s requirements. This ongoing commitment and success has resulted in Momentum Built being successful in appointment to numerous contractor panels including but not limited to Sydney Anglican Schools Corporation, Catholic Education Office, Department of Transport Sydney Trains, Department of Public Works, Wollongong City Council, Randwick City Council, Rockdale City Council and University of Technology Sydney. 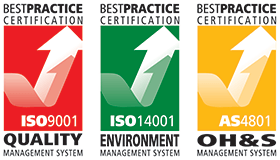 Momentum Built maintains a certified Quality Management System (ISO 9001:2015 Quality Management Systems) with Best Practice Certification that incorporates a Risk management framework in accordance with AS4360 to manage Quality, WHS and Environmental Risk on all construction projects.